TAIPEI, Taiwan, August 23, 2011 – AMD’s release of APU processor is a huge revolution. The new Llano architectures are a shot in the arm for integrated graphics, delivering the most powerful discrete-level graphics performance in mainstream market. Following the great launch of ASRock A75 mobo platform, ASRock is delighted to introduce its fantastic APU Motherboard Series based on the AMD A55 chipset. Supporting AMD Fusion A-Series APU, Socket FM1, DirectX® 11 technology and a wide range of ASRock signature functions, ASRock brand new A55 APU Motherboard Series will surely bring the perfect components and combos to build up the ultimate rig! Commenting on the new release, James Lee, V.P of ASRock Sales and Marketing, is with confidence. “ASRock A55 APU Motherboard Series has more to offer than just the combined powers of integrated graphics processor, as ASRock motherboards are best known for its perfect balance between price and performance. If users are looking for a value mobo supporting AMD’s full-power 32nm Llano processor, then ASRock A55 platform is unambiguously the best choice!” He stated. A55 Pro3, the vanguard of the latest A55 APU Motherboard Series. The innovative AMD Radeon™ Dual Graphics Technology combines the powers of APU and discrete GPU, providing significant performance boost and immersive gaming experience. The most charming feature of A55 Pro3 is obviously the perfect performance of APU graphics. Paired with A55 Hudson-D2 chipset and APU processor, the board brings advanced visual excitements in the field of integrated graphics. It delivers the most powerful APU graphics ever. è Compared with other A55 motherboard, the ASRock A55 series MB provides up to 50.82% performance boost in 3DMark Vantage (performance mode) test. In terms of Onboard APU Graphics and Dual Graphics Performance items, ASRock A55 Pro3 shows its distinctive test result. Another highlight here is the DRAM support. 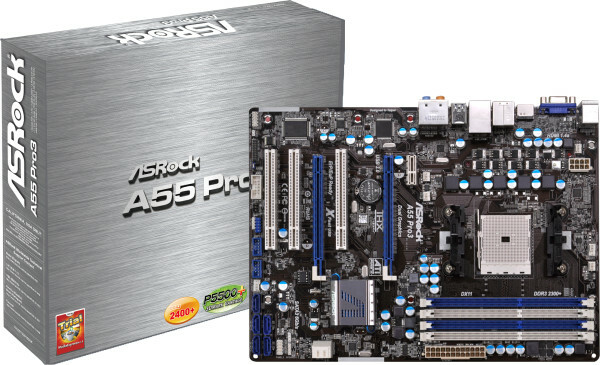 ASRock A55 platform is the world’s fastest motherboard coming with DDR3 2400+ support! Users will get a whole new socket in the shape of the FM1 which is compatible of AMD’s 32nm transistor Llano APU. The APU processor integrates AMD Radeon HD 65XX/64XX and DirectX®11 graphics technology, delivering the optimized visual enjoyment to users. Steady Video™ leverages the processing power of the GPU in order to remove shakiness from the home/online video. Considering high-speed SATA3 and USB 3.0 is a must, ASRock A55 Pro3 provides 2 SATA3 and 2 USB 3.0 ports to satisfy users’ needs. Other features include 2 PCIe 2.0 x16 slots cater for Quad CrossFireX and CrossFireX settings, dual-VGA outputs (D-Sub and HDMI) and 7.1CH HD Audio with THX TruStudio™ support. Three ASRock A55 motherboards are available at launch – A55 Pro3, A55iCafe and A55M-HVS, two ATX and one Micro ATX models. In addition to the AMD’s exciting functions, there’s a couple of extra goodies thrown in too. To name a few, ASRock A55 platform comes with graphical UEFI, XFast LAN, XFast USB, On/Off Play, CyberLink MediaEspresso 6.5 (trial) and MAGIX Multimedia suite to facilitate computing environment. ASRock A55 Motherboard Series have superior software tools and better features on other A55 motherboards you’ve seen! As the pioneer in motherboard industry, ASRock pays special attention to detail in order to provide consumers premium quality and feature-rich motherboards. We always give you more than you expected!